Businesses still struggle to adequately deal with complaints from disabled customers and are risking unnecessary litigation and reputational damage due to an absence of common sense policies and procedures, according to a leading disability consultant. Tracey Proudlock, founder of inclusive design consultancy Proudlock Associates, believes there is still a significant disconnect between disabled customers and businesses when it comes to resolving complaints, with a more considered, collaborative approach called for to avoid pain on both sides. The claim is brought into sharp focus this week as the Supreme Court prepares to deliver a verdict in the much publicised Paulley vs First Group case, where a wheelchair user was denied access to a bus where the dedicated wheelchair space was already taken by a sleeping child in a buggy. If the Court upholds the original decision that Paulley was discriminated against it will leave the door open to many more costly claims from dissatisfied disabled complainants. Typically, costs for businesses falling foul of the goods and services provisions of the Equality Act* run into five figures in addition to costly reputational damage. “Business has taken great strides in recent years to give disabled customers the service they deserve but when things do go wrong, many still don’t know how to best deal with the fallout,” says Tracey, herself a wheelchair user. 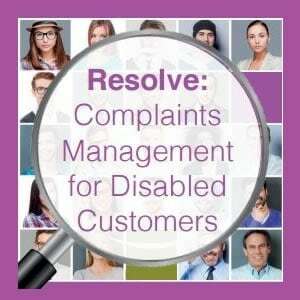 To help businesses better get to grips with complaints from disabled customers, Proudlock Associates is launching Resolve, a unique new business service to help companies work with disabled complainants who believe they have been partly or wholly denied access to a service or experienced poor accessibility. The firm’s experienced disability and access consultants will work with complainants to reassure them that the issue will be dealt with swiftly and efficiently and help businesses put in place more consistent and better communicated policies to avoid recurring issues and the threat of litigation. *Under the Equality Act 2010 service providers must remove the barriers disabled people face so they can access and use goods and services in the same way as people without a disability. It does not matter how the goods and services are provided and whether online or in a shop, companies have a duty to make reasonable adjustments. ***Proudlock Associates is a leading disability access and inclusive design consultancy with both auditor and consultant member status on the National Register of Access Consultants. The firm provides professional services, such as access audits, statements and equality training to help organisations remove disabling barriers and provide for inclusion in design and management.